Ethereum has been the largest altcoin by market capitalization for the majority of 2018. The cryptocurrency showed investors a phenomenal return in 2017 when it appreciated from approximately $8 at the start of the year to over $1400. While Bitcoin performed well as a transfer or store of value, the Bitcoin programming language makes it very difficult to develop decentralized applications or create smart contracts. The solidity language which Ethereum uses made it possible to generate in a few lines of code what would be highly complex in Bitcoin’s coding language. This led to an ecosystem being created where tokens native to the Ethereum blockchain were launched, fundraising conducted, and a host of DApps developed. There are numerous tokens developed which are native to the Ethereum blockchain and they play an important role for traders and investors. If you have trading experience, scroll down to the ‘Best Ethereum Exchanges For Traders’ section to benefit from low trading fees and high exchange liquidity. Ethereum has also reached a position where it is an important pairing cryptocurrency. For a long time, fiat currencies and Bitcoin were the only base currencies altcoins were priced against. The rise to prominence of Ethereum has made it an important base currency as well. With this unique position of Ethereum, we delve into what are the best exchanges for trading Ethereum and Ethereum-based tokens. If you’re thinking of buying your first cryptocurrency, whether it’s Ethereum or any other, we recommend you to check out our ‘Making Your First Step‘ guide to help you get started. Coinbase’s traditional Coinbase Consumer service enables traders to easily purchase popular cryptocurrencies such as Ethereum. Users can purchase Ethereum online on the Coinbase exchange platform through a variety of payments methods. Coinbase simplify the complicated cryptocurrency concepts such as wallets and transactions to make it easy for the first time user to understand. Coinbase is a good service for beginners because it simplifies the process, but it also is widely available. There are not many restricted areas where Coinbase does not operate. There is a number of payment methods users can use to purchase Ethereum on Coinbase. Users can fund their account via bank transfer or wire transfer. Major fiat currencies such as EUR, GBP, and USD are supported for this method. Another option is using a debit or credit card. This enables users to purchase cryptocurrencies is a wide variety of local currencies. The fee for purchasing via debit or credit card is 3.99% and there is a 1.49% fee for buying and selling between fiat and Ethereum. Coinbase has a heavy focus on compliance with regulations. This means the sign-up process involves users submitting numerous pieces of personal information along with verifying their identity through documentation. Some users find this overly invasive, but it is a trade-off which is made to use an institution which is backed by large investors and is compliant with regulations. CEX is an exchange which makes purchasing Ethereum easy for beginners and also offers more advanced trading features. Once users set up their account through a very straightforward and quick sign-up process, they will be able to purchase cryptocurrencies with their debit or credit cards. There will be strict limits applied to how much they can buy but if they wish to extend their limits, they can choose to verify their account further. Users are quoted specified amounts of cryptocurrency that they can purchase. Users can choose between $200, $500, and $1000 amounts. Users also have the option to choose custom amounts to purchase. Although the default option is Bitcoin, this can be easily changed to Ethereum. The quoted amounts are recalculated every two minutes. Although this is the easiest option for the beginner, CEX does charge a 7% fee for this service which is included in the quote. If this purchase is completed through debit or credit card, there will be a further payment processing fee. Despite the fees being higher to use debit and credit cards, the ability to pay through this method is an attractive feature for a lot of users as it enables them to purchase in a wide variety of local fiat currencies. CEX also have a more advanced exchange where users can avail of lower trading fees along with margin trading. The margin trading enables users to go both short and long and also to apply leverage to their position. Although this is perfectly suitable for the beginner, it provides valuable features to the exchange. The fee schedule for trading on the more advanced exchange is much lower than the quick-purchase option and also highly competitive. Overall, CEX is a great online exchange for beginners because of its options which enable users to buy Ethereum quickly and easily. When getting started, it can be difficult for users to navigate exchanges but CEX makes this as straightforward as possible. It is also important to be aware of the fees that will be paid for this quick option. Another aspect which makes CEX suitable for beginners is when they are ready to get more advanced, they can delve into the more advanced exchange options. Binance is the exchange with the largest amount of trading volume. It completed it’s ICO in 2017 and quickly grew to be the market leader. Binance has Ethereum as one of its main pairing currencies. There are over 150 products offered on Binance which can be traded against Ethereum. This allows users to speculate on the movements of altcoins against Ethereum and grow their Ethereum holdings if they speculate correctly. 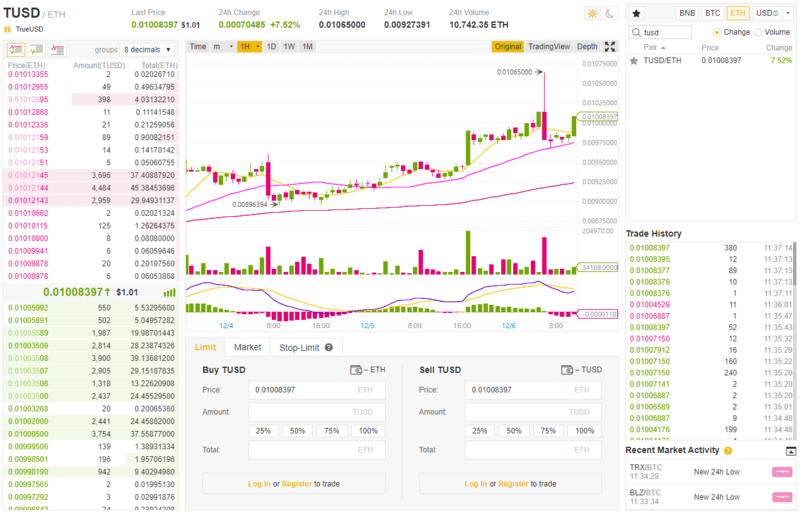 Binance provides a suite of tools essential for professional traders. The tools include an order book, price chart, and a depth chart. Binance is also highly competitive with their fee schedule. 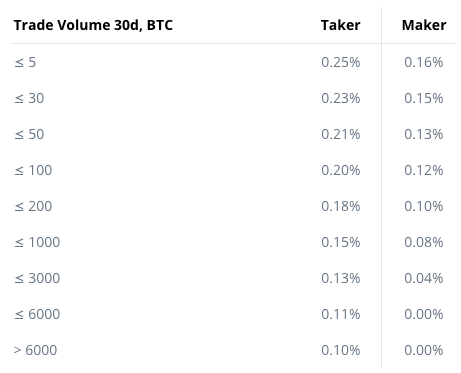 The fees start at 0.1% and get progressively lower based on trading volume and BNB holdings. BNB is Binance’s own cryptocurrency which was distributed during the ICO in 2017 when Binance was raising funds to develop the exchange. Holders of BNB avail of lower fees. With Binance not operating with fiat currencies, they remain largely unregulated. Binance has recently moved their headquarters to Malta to take action towards being more regulated. Malta is developing a regulatory framework for businesses operating in cryptocurrencies and it is likely that Binance will be compliant with these regulations. If the goal is to simply speculate on the price of Ethereum in relation to major fiat currencies at attractive costs, Coinbase Pro is a great option to consider. Coinbase’s traditional service is hugely popular with first-time cryptocurrency buyers but the fees are huge. Coinbase Pro is another service offered by Coinbase which is tailored towards professional traders. The service offers a suite of tools including an order book, depth chart, price chart, and recent trades printing. It also one of the most liquid exchanges. Users can speculate on the price of Ethereum against USD, EUR, and GBP. Users can place a number of different order types including limit, market, and stop. A limit order communicates to the exchange to execute the trade if the price reaches a certain price or more attractive. For example, a limit order could be to buy 2 Ethereum at $200. This order will only execute if the price drops to or below $200. Traders who make these kinds of orders are called market makers as they provide liquidity to the exchange. A market order takes the best possible price at the time. Users who make this type of order are known as market takers. This is because they take liquidity from the exchange. One of the most attractive features of Coinbase Pro is the fee schedule. Market makers can actually trade for free as they provide much-needed liquidity. Market takers have a progressive fee structure based on the volume traded. Coinbase also places a key emphasis on compliance. It complies with all the relevant regulations in the United States and the other jurisdictions in which it operates. The exchange has significant backing from investors and has recently completed its Series E round of funding which puts the company at a valuation of $8 Billion. Signing up for Coinbase Pro will require further identification than what is required when signing up for Coinbase’s mainstream consumer service. Kraken is another highly liquid exchange where you can trade Ethereum for fiat currencies. The exchange is headquartered in San Francisco and was founded in 2011 giving it a long history of operation. Kraken has been backed by a number of significant investors including Money Partners Group, Hummingbird Ventures, Blockchain Capital, and Digital Currency Group. It is a good exchange to consider due to its high amount of liquidity along with its competitive fee schedule. Kraken also applies strong security procedures. When you deposit Ethereum or fiat currency with an exchange, it can be difficult to know what the exchange is doing with that money. They could essentially be doing their own form of fractional reserve banking where only a fraction of the money is kept and the rest is put to more risky use that may provide a return. Kraken conducts proof of reserves audits to communicate to clients that they have the reserves to cover all of the necessary balances. The vast majority of coins are also stored in cold storage offline. The fiat currencies it supports include the USD, EUR, CAD, GBP, and JPY. 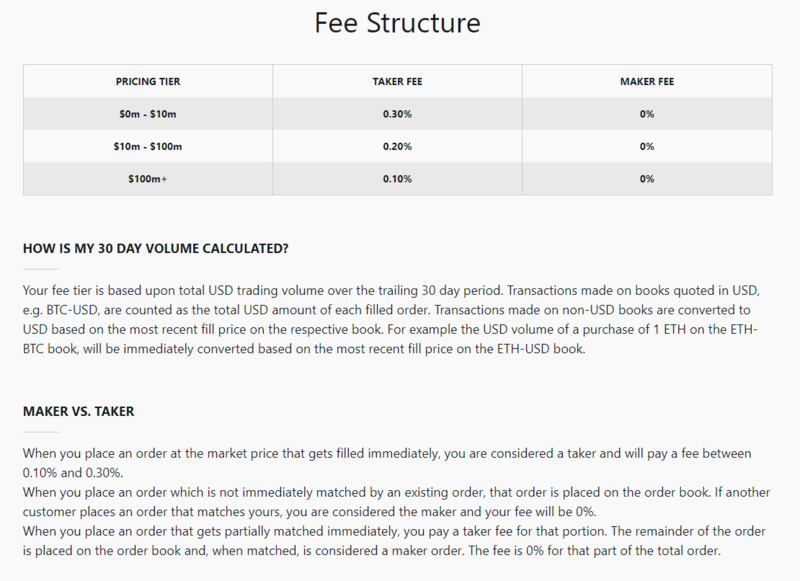 The fees for Ethereum follow the below schedule. One of the key features which Kraken provides that other exchanges don’t is the ability to go short. Traders on Kraken can utilize margin trading to both increases their exposure to long positions or take short positions. The fees for margin trading range from 0.01% to 0.02% to open the position and 0.01% to 0.02% every four hours to maintain the position. The key strengths of Kraken include its level of liquidity, the ability for traders to make margin trades and take short positions, and its security measures and auditing practices. The regulation situation may concern some but Kraken has always been clear and communicative with its clients regarding any concerns. Ethfinex is a decentralized exchange, unlike the ones mentioned above which are all centralized. One of the key issues with centralized exchanges is users lose the control of their funds. Once users deposit their funds with an external entity, this entity now has the ultimate control of the funds. If the exchange gets hacked or goes bankrupt, the users will lose their funds. This has been demonstrated numerous times in cryptocurrencies history. The Mt.Gox hack of 2014 resulted in users of the exchange losing 850,000 Bitcoin. Many businesses have been now venturing into decentralized exchanges to tackle this. Decentralized exchanges put users in control of their own funds as it provides users with their own private keys. Bitfinex has developed the decentralized exchange Ethfinex. For users who wish to remain anonymous, there will also be no sign-ups or KYC process. The exchange includes tools for traders such as a price chart, depth chart, order book, and recent trades printing. There is also a wide variety of technical analysis tools available for the price chart. Users will have an account for exchange trading, margin trading, and funding other traders margin. The margin account allows users to go both short and long. Funding other traders margin provides an interest rate return. The exchange also has a native token, Nectar. Users of the exchange are required to store some Nectar in their accounts. The exchange mainly facilitates for trading in Ethereum and Ethereum based tokens. The fees for trades are competitive but fees are also applied for depositing and withdrawing cryptocurrencies which is a drawback. Some of the fees go to holders of the Nectar tokens. Overall, decentralized exchanges still need to develop to provide a better service. But for those who wish to control their own private keys, Ethfinex will facilitate this. LocalEthereum is another service which tackles some of the problems with traditional exchanges. Traditionally, centralized exchanges expose investors to the risks of the exchange itself but they also often require detailed information on the users. Some operators in the cryptocurrency markets wish to remain anonymous and traditional exchanges can often make this impossible. Local Ethereum is a peer-to-peer exchange powered by smart contracts. LocalEthereum is a marketplace made of bids and offers by different entities. Setting up an account is straightforward and simple and requires no sensitive information. The trade is conducted via a smart contract that acts as an escrow. A dispute can also be opened if there are issues with the trade. LocalEthereum charges 0.25% to the person who posts the offer to the exchange and 0.75% to those who take an offer.